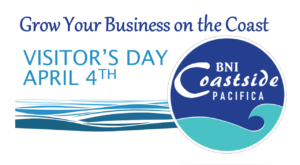 BNI Coastside is the Pacifica chapter of Business Networking International (BNI), a global network of local businesses dedicated to mutual support and best-practice business growth. Imagine if you had a sales team of professionals promoting your business. The members of Coastside are each other’s sales team. Every day, in every client meeting, at every networking event, and in any other conversation— Coastside members are listening for other people’s needs. When someone needs your services, members are ready with your name, contact information, and business card. Plus, with over 200,000 BNI members in 7,500+ chapters worldwide, you’re part of the world’s leading referral organization. In 2016, over 211,000 members of BNI worldwide passed over 8.8 million referrals which resulted in more than $11.2 billion in business. Since its inception in 1985, BNI referrals have generated $63 billion in business worldwide! Our mission is to help members increase their business through a structured, positive, and professional “word-of-mouth” program that enables them to develop long-term, meaningful relationships with quality business professionals. BNI offers members the opportunity to share ideas, contacts, and most importantly business referrals. We also have a lot of fun! To read about our chapter members, please visit our BNI Coastside regional web page. We look forward to welcoming you to BNI Coastside soon!